Welcome to the archive of the Union of Socialist Geographers! Thanks to the tireless work of Jim Thatcher (University of Washington Tacoma), Eric Sheppard (University of California Los Angeles), and Clark Akatiff (one-time Professor/life-long professor of geography), Antipode is able to make available the USG’s Newsletters, published from 1975 to 1982, as well as its final publication from 1983, “Society and Nature: Socialist Perspectives on the Relationship Between Human and Physical Geography”. The Union of Socialist Geographers was formed 43 years ago this month, on a day that Clark Akatiff has called a “great day in Toronto!”. It was the third group of geographers to form in the Anglophone world around explicitly radical and critical approaches to the discipline, following Antipode (in 1969) and the Socially and Ecologically Responsible Geographers (SERGE in 1971) (see Peake and Sheppard in ACME). 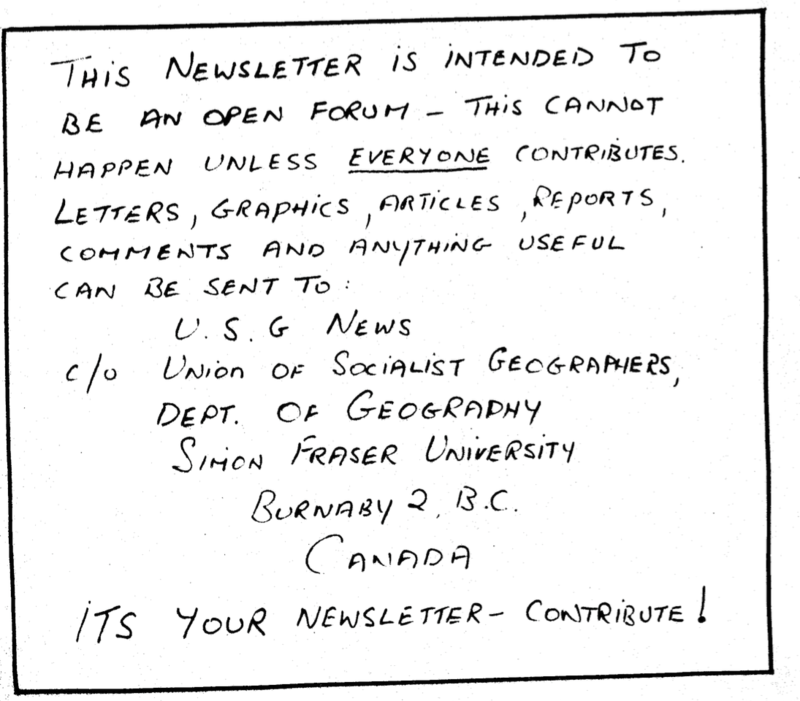 During, but adjacent to, the annual meetings of the Canadian Association of Geographers, a “large group of radical and socialist geographers from throughout North America met to discuss items of mutual interest” (USG Provisional Organizing Committee, Communication One; available here). They met in a hall rented by Toronto Geographical Expedition, which, in turn, was one of the expeditions supported through Bill Bunge’s Society for Human Exploration (SHE). SHE, still in the process of forming, was intended as a sponsoring agent for multiple expeditions, the publisher of field reports (such as the DGEI “field notes”, available here), and to grant awards. 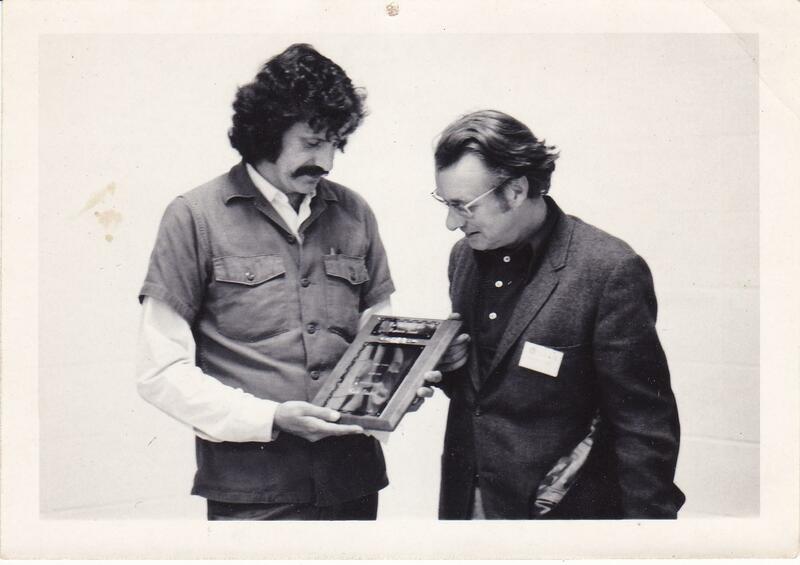 In the May of 1974, they met to award the “Griffith Taylor Medal for Human Exploration” to Clark Akatiff. From the discussions held there, the USG was formed. Over the course of its roughly decade-long existence, collectives would form in Toronto, Vancouver, Minnesota, and eventually Australia and the United Kingdom. It held meetings that paralleled and alternated between the AAG and CAG meetings during this time (New Orleans, Vancouver, Louisville, etc.) and, all told, would publish eight volumes of (mostly) multi-issue newsletters, at least one book, and various other memoranda. 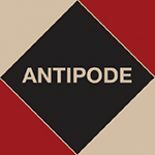 At the beginning, the Toronto and Vancouver hubs dominated the organization, particularly the one located at Simon Fraser University where the first issue was produced in 1975 (on which see these pieces in Antipode from the time, available here and here). Through volume four of the newsletter, publication circulated among a variety of collectives including Vancouver and Toronto, but also Minnesota, Sydney (Australia), and London (England). By volume five, Simon Fraser could no longer serve as the principal organizing and editing collective. Graduate students were leaving and the department had become increasingly inimical to the project. At that time, Eric Sheppard and the Minnesota group stepped in and coordinated the publication of volumes 5 and 6. It was then (in 1979), that an internal struggle in the USG came to a head. On one side, spearheaded by younger members like Neil Smith and Eric Sheppard, there was a push to take advantage of the AAG’s recent initiative of creating formal specialty groups as a means of better establishing socialist geography within the discipline and its journals. On the other, older members like Jim Blaut, drawing on their years of organizing experience, suggested that such a formation would inevitably lead to the demise of the USG as an independent entity. The younger geographers won out and issue 5(1) contains a plea to organize the 100 necessary signatures to form a specialty group. The signatures were gathered and the Socialist Geography Specialty Group (SGSG) was formed, with all founding directors drawn from USG membership. The group met for the first time at the Louisville AAG meeting (a number of its annual reports and newsletters from the 1980s and 1990s are available here). Ultimately, both sides were correct: socialist/radical/critical geographies grew to profoundly shape the canons of Anglophone geography … and the USG withered. Volume 7 was the (missing) “British Isles Edition” and the lone issue of volume 8 was edited by Chrys Rodrigue of CSU Northridge. Volume 8(1) is a mere four pages long, much diminished from the 88 pages of volume 6(2) published only a year earlier. In it, Rodrigue acknowledges that the SGSG had drained energy from the USG and that socialist geographers now had much greater access to mainstream geography journals and workshops. It was already a far cry from when the USG launched the first-ever graduate student-organized session at the IBG meetings only a few years earlier. It is that material that we have collected here. Over the past year, Clark Akatiff, Eric Sheppard, and Jim Thatcher have worked to recover and digitize what remains of the corpus of the Union of Socialist Geographers. This archive is known to be incomplete; despite chasing leads that led from James Sidaway to Ron Johnston to Jo Norcup and others, we were unable to recover a single issue of volume 7. There are also passing references to a number of textbooks, manuscripts, and other documents that were to have been published by the USG, the existence of which we were unable to confirm. As such, we encourage those readers who might have copies to please check their archives (as Malcolm Forbes put it when we reached him, often simply “a box in the attic”) and contact us with any additional material. There are three entwined reasons why we feel this material is worth resurrecting at this time. First, this very real near history of radical geography is disappearing at a time when it seems most urgent to remember. Luminaries like Julie Graham and Neil Smith, who have sadly left us, appear in these pages as vibrant, young scholars carving out the paths that many of us follow today (see especially Graham’s letter on the Regional Development Unit at Clark, and Smith’s “Toward a Serious Theory of Uneven Development”, both in 4). Second, just as these newsletters chart a disappearing “near-history” of individual scholars, they also reveal the contested political terrain along which early radical and critical geography found itself. For example, in volume 2(2), William Bunge’s letter and the editorial response deal explicitly with the existence, role, and practice of homosexuality within socialist movements (pages 18-21). While today it may seem antithetical to practice “radical” politics while excluding LBGTQ issues, at the time it was something that can, and was, debated in the USG Newsletters. Finally, and building directly from the previous two reasons, while both the USG itself and its newsletters were intentionally and explicitly guided by socialist and Marxist ideals and commitments, the newsletters work through a variety of concepts and approaches to radical and critical geography over the course of the volumes. 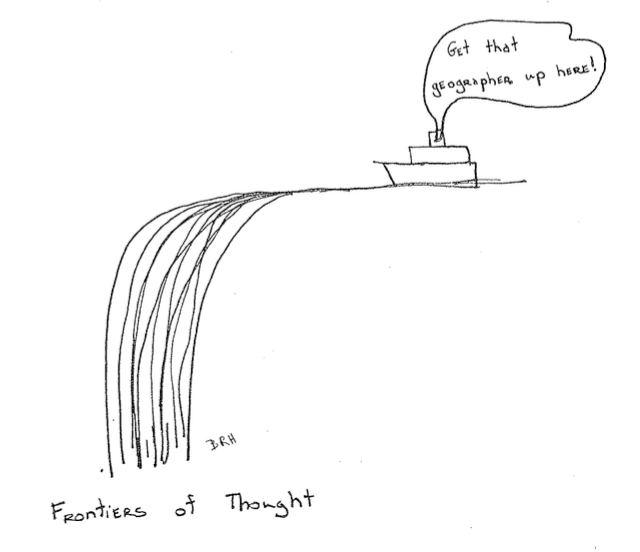 At first, the Newsletter’s editors saw it as an “experimental medium” different from the early Antipode in its more limited focus (on socialist perspectives versus “radical” ones more broadly) and in its willingness to publish shorter pieces, notes, and even comics (1[4/5], page 1); however, over time, a variety of themes relevant today are explored within its pages: volume 3(3) focused on anarchism, while the newsletters also served throughout as a sounding board and organizational space for feminist approaches to and research in geography (see as examples both Judy Stamp and Suzanne Mackenzie’s letters in 3, pages 3 and 22 respectively; Bonnie Loyd’s piece in 3, pages 30-32; or Jo Foord’s research note in 5[2/3], pages 44-50, which might be read as a Marxist analysis of feminist thought). These and other themes were broached, vehemently debated, and often amusingly critiqued in the pages of the newsletter. It was an international, diverse space of collective learning that published young scholars (such as Trevor Barnes’ first publication in 5, and an early career Katherine Gibson in 4) as well as reading lists and experimental syllabuses on a host of topics still relevant today, like a survey of works on imperialism or a bibliography for Peter Kropotkin (both 1). [T]he purpose of our union is to work for the radical restructuring of our societies in accord with the principles of social justice. As geographers and as people we will contribute to this process in two complimentary ways: (1) organizing and working for radical change in our communities; and (2) developing geographic theory to contribute to revolutionary struggle. Certainly, technology today makes it much easier to hold conversations through a host of mediated forms, from email to Twitter; but, there remains nothing quite so sustained and dedicated as the USG during its lifetime. Maybe there should be.